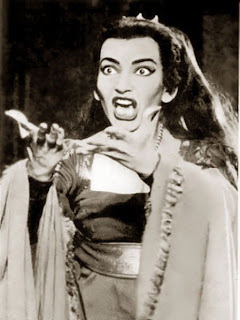 A Liberal's Libretto: Happy Birthday to Maria Callas! In honor of her 94th birthday, I have to revisit this clip of La Divina — because it’s phenomenal. So, do you ever think about what someone like Maria Callas did on stage when the wheels started coming off the musical bus? I know I do. Well, if you're a YouTube-geek, like I am (and you know you are), you may have already seen this clip. If so, it's worth another look - for sure. If you've not seen it ... trust me, you'll find much pleasure in this week's Another Favorite Clip. In this vintage-1958 Callas clip, we see La Divina hauling out another "Casta Diva" from Bellini's Norma. Only this time, when the chorus comes in part way through the first half, they begin singing a little late and while some try to catch up, others dig their feet in. What we're left with is a diva, center stage, flanked by a chorus that is singing out of sync. La Divina is having NONE of that. As she joins the choir (approx the 1:57 mark), she holds up her hand in order to tell them to cease .... perfection. It doesn't just stop there, though. Shortly thereafter, she cues the choir to come in at the proper spot by tilting her head back slightly. Yes. She. Does. As soon as everyone gets back in sync with each other, she gives a look to stage left - I'm assuming the look is toward the offending party - and gives whomever she's looking at a *serious* up/down. You think I'm joking? Have a look ... and, enjoy! I know I did.